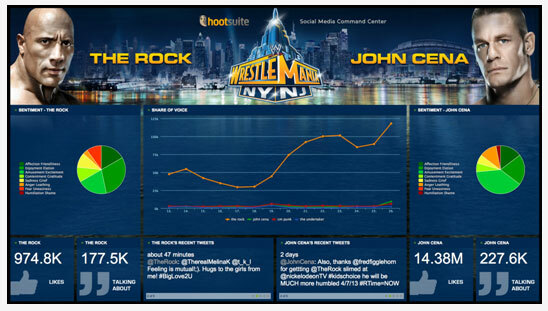 HootSuite has teamed up with HootSuite Enterprise client WWE to bring to you the ultimate social media command centre. The live display will bring the social interactions of WWE WrestleMania 29 viewers to fans in New Jersey’s MetLife Stadium on April 7, 2013. Before the bout between two wrestling legends, The Rock and John Cena, fans will be able to follow along as these two athletes “duke it out” on Facebook and Twitter. Since WWE fans are some of the most active social media users on the planet, they’ll have plenty to say about the competing wrestlers before, during, and after the main event. Whether you’re a fan of The Rock’s ‘People’s Elbow’ or you prefer John Cena’s ‘Five Knuckle Shuffle,’ your Tweet can sway the social media tide in favor of one potential WrestleMania 29 champion. HootSuite’s social media command centres have been used to compare the social media success of the Baltimore Ravens and the San Francisco 49ers leading up to Super Bowl XLVII, as well as President Barack Obama and Senator Mitt Romney during their 2012 election campaigns. Now HootSuite is ducking through the ropes, in a dramatic entrance into a new arena, one filled to the rafters with the social media-loving fans of the WWE, a HootSuite Enterprise client. Visit the command centre now. This entry was posted on Tuesday, April 2nd, 2013 at 6:38 am and is filed under Business News, Events, National News, Social Media. You can follow any responses to this entry through the RSS 2.0 feed. You can leave a response, or trackback from your own site.